With 9 ounces of wool in various colors, needle felting needles, and even a 180-minute workshop DVD from Sharon Costello, you can create one (or more!) needle felted animals. Create your own needle felted animal with this needle felting kit! We supply you with all you need to enjoy a fun and easy needle felting project (or two! ), from the needles to the fiber. 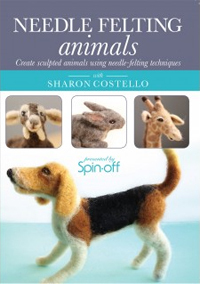 This kit also includes an instructional DVD workshop from needle felting expert Sharon Costello. Sharon Costello's 180-minute workshop DVD Needle Felting Animals with tips, techniques, and step-by-step instructions for needle felting a variety of animals. Make one big needle felted animal or a whole zoo of smaller ones, the options are endless.